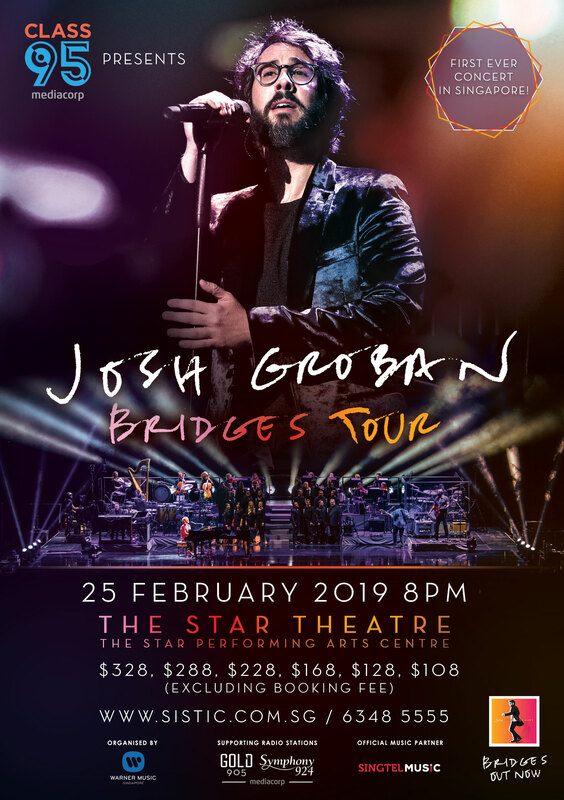 The unmistakable voice behind the global hit “You Raise Me Up”, Josh Groban will bring his acclaimed Bridges Tour to The Star Theatre, The Star Performing Arts Centre on 25 Feb (Mon), 8pm for one night only. This will be Josh Groban’s first time performing in Singapore and he will be joined on stage by a full orchestra and choir to deliver an unforgettable performance. Tickets are available at SISTIC now! Josh Groban’s rich baritone voice is instantly recognisable and unparalleled among his peers. He has sold over 30 million albums worldwide and entertained fans across the globe with his electrifying live performances. The 35-year-old Los Angeles native first broke through in 2001 with his self-titled 5x platinum debut album, followed by 2003’s 6x platinum Closer, and 2006’s double-platinum Awake. In 2007, he became the best-selling recording artist of the year thanks to sales of Awake and his blockbuster 6x platinum, Grammy-nominated Christmas album, Noel — the best-selling album of 2007. The subsequent albums – 2010’s Illuminations, 2013’s All That Echoes and 2015’s Stages – continued his streak of sales and chart successes. Groban’s latest album Bridges was released on 21 September 2018 to critical acclaim. The album features the singles “Granted” and “River”, and also includes duets with Andrea Bocelli and Sarah McLachlan. The Bridges Tour will see Groban perform songs from the new album as well as all of his biggest hits, including “You Raise Me Up”, “You Are Loved (Don’t Give Up)”, “To Where You Are” and many more. This is undoubtedly the concert event of the year. Join Josh Groban on a musical journey that fans and critics are describing as “magical”, “stirring” and “a night not to be missed”. Brought to you by Class 95 and Warner Music Singapore.